A convenience store should be convenient. That’s the simple philosophy guiding 7-Eleven’s expansion. The retail giant—with over 50,000 locations worldwide—plans to open a staggering 400–600 new stores per year. And that’s just in the United States. Globally, the number climbs to 2,000. Company executives like executive vice president and chief operating officer Darren Rebelez are focused on developing stores in a concentrated fashion by growing in markets where the company has an existing presence, thereby maximizing marketing, supply, and distribution efforts. Rebelez, who entered retail after graduating from West Point and serving in the Gulf War, started his civilian career with Kentucky Fried Chicken. Retail came naturally to the young businessman whose grandfather immigrated to San Diego from Mexico and worked as a barber. Rebelez left KFC for positions at Thornton Oil and later ExxonMobil. “I’ve often had to do new things as I’ve moved up in my career, but it’s important to stay flexible, because you never know when all the pieces will come together,” he says. For Rebelez, those pieces gelled at 7-Eleven, where he started managing store operations. The position combined the leadership skills he learned in the army with a talent for retail business developed on the job, but it’s a seat on the board of Torchmark Corporation that Rebelez says has helped him develop professionally and ensure continued success at 7-Eleven. “Boards play an important role in the life of a company,” he says. “I wanted to learn from the perspectives of other members and have the chance to contribute at another major company.” Furthermore, Rebelez recognized that board membership would help him develop and advance as an executive. Things fell Rebelez’s way after an extensive vetting process with Torchmark. He had the desired business operational experience, and he found out that Torchmark was looking for someone familiar with the middle-market consumer—7-Eleven’s demographic. The board offered Rebelez a position on its audit committee, where he focused on the company’s internal controls and SOX (Sarbanes-Oxley Act) compliance for three years before moving to the compensation committee last year. There, he helps set CEO compensation and ensure regulatory compliance. 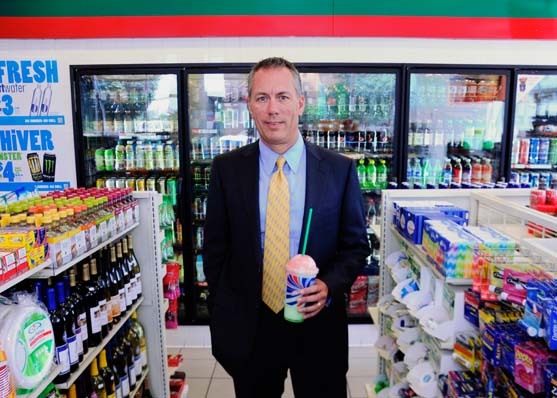 The experience has helped him think more strategically about business at 7-Eleven. “I’ve learned many things that help me in my job that I never would have learned without serving on the board,” Rebelez says. Torchmark, for example, is a publicly traded company, while 7-Eleven is a privately held subsidiary of its Japanese parent company, Seven & i Holdings. Now, Rebelez has gained valuable exposure to a large public company with governance and shareholder opportunities that will help him understand the business and contribute in new ways as 7-Eleven becomes a bigger part of Seven & i Holdings. As a Latino, Rebelez appreciates the chance to provide Torchmark insight about his culture and share how a company can respond to a shifting and growing demographic. After all, no profitable company that wants to stay competitive can ignore how influential the growing Hispanic and Latino buyer will become in the next 5–10 years. Rebelez also relishes the opportunity to serve as a role model to aspiring Latino professionals. “Young Latinos need to see someone like them serving in a high-profile role to understand that it is possible, and to realize that they can do it, too,” says Rebelez, noting that he also looks to promote the idea of diversity when the board considers new members. While Latinos are underrepresented in the American boardroom, Rebelez says the issue lies in the talent pipeline. “For more Latinos to be on corporate boards, more Latinos have to be qualified to be on corporate boards,” he remarks. Latinos often work in diversity or community outreach programs, and while those programs can be good, Rebelez says candidates might actually be hurting their chances. An aspiring board member or corporate executive should instead get as close as possible to his or her company’s core and work to take on leadership roles in main areas of the business to be more prepared. Board members are most often recruited from C-level positions, and those doing the recruiting are unlikely to look in a company’s fringe programs, no matter how worthwhile they are. With 10,000 stores in North America falling under his leadership, Rebelez is busy at 7-Eleven with operations, store development, IT, and other issues. One of his most important projects is business transformation, through which the company is providing several technical solutions designed to help stores run more efficiently. Each location is receiving inventory management and product selection tools tied into existing IT systems that help tailor the product assortment to meet specific local needs. The team is also rolling out a new digital guest experience app that creates a mobile connection with customers where users download an app to access coupons and store information. Eventually, the app will evolve to follow each customer’s specific behavior and tailor offers to individual users. To get to know the other ‘Best of the Boardroom’ leaders, click here.